More cookies constantly scroll onto the screen, which can help if you need more cookies to complete a line, but if the screen fills up with cookies then it's Game Over. As you progress, the speed and variety of cookies increase. Bulletproof Software (BPS) unveiled a puzzle game at the Consumer Electronics Show in 1992 called Hermetica. The licenses for Famicom/NES and Game Boy adaptions of the game were snatched up by Nintendo, and the game became Yoshi's Cookie. 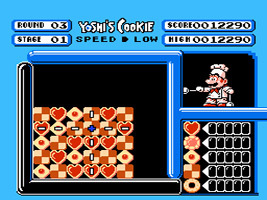 The Super NES license stayed with BPS, who also adopted the Yoshi's Cookie branding, but published the game themselves. Hermetica was never released in its original format.